There are bits of good news. Like we are in Gettysburg and I finally got a hotel room with a king size bed. I have been trying to get Alan to realize the possibilities. He is there comfortingly snoring away BUT I also have incredible amounts of space over here. My insomnia plagued self can toss and turn at will, assuming any position I like without worrying that I will ruin his sleep as well as my own. More good news..I have enough yarn and needles to start any hat I want on the drive home. So what is the bad news, you ask? Well, we left the house and drove on deeply slush covered roads, then behind snow plows for half an hour just to leave Ottawa. I had been proud of the speed and efficiency with which we had dispatched breakfast and packing. We crossed the border and the guard said ‘be careful, it is really bad near Watertown’. Uh,oh we had thought it was bad already, but he was right. This was the road condition for at least half an hour. We were basically following the emergency flashers of the car in front, but you can see the ruts which indicate the lanes on the highway. We almost turned around but there was no place to do that. We came out the other side and there was an accident scene with at least six cars in the ditch. It looked like they had followed each other’s flashers right off the road. I guess there were no ruts at that time. ANYWAY, here is the bad news..I have to show up at a sewing class tomorrow and admit that although I have plenty of wool and knitting needles, but my efficient packing did not run as far as my sewing machine and notions, which are still set up waiting for me in my dining room. The truly sad part is that I have taken lots of classes with this group of people and possibly none of them will be surprised. 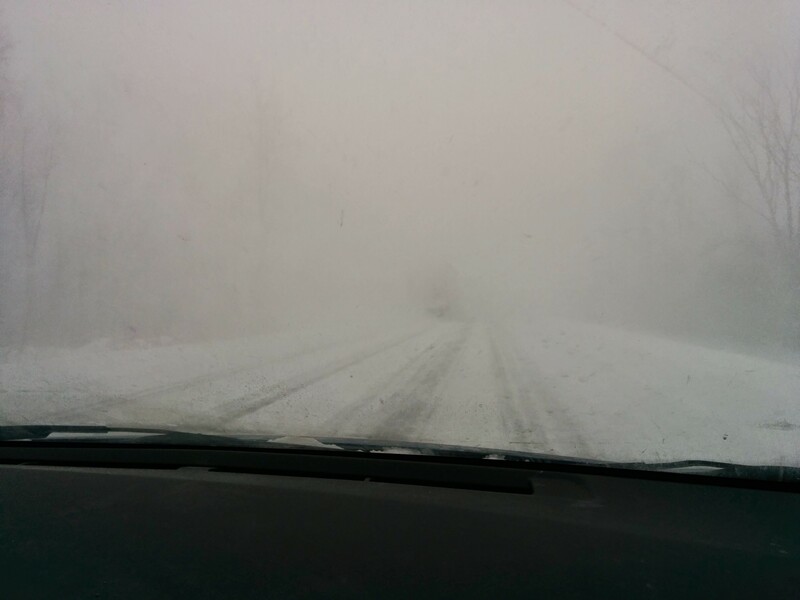 This entry was posted in Living history, travel and tagged gettysburg, poor road conditions, travel on January 10, 2015 by gillianknitter. It was ok when Heather was here and needed black socks for her work without any other criteria but black. But alas, she has emptied the nest and become a clothing minimalist. She has decided she will wear nothing but grey t-shirts and black pants for the next year. She bought 7 identical t-shirts and 3 pairs of pants. Cuts down on decision making in the mornings, she says. Just grab the next clean one off the pile. It is apparently a thing these days amongst those in the know. And having the beauty of youth makes it matter not what you wear anyway. I usually go to Gettysburg for sewing classes or Harrisburg for a civil war conference at least once a year. It is a tradition to visit Cracker Barrel restaurants for pretty much every meal on the way down and back. We don’t have them in Canada, and you gotta love that comfort food. This entry was posted in Living history, travel and tagged Civil war, civil war reenacting, Cracker Barrel, gettysburg, Living history, Pa on January 8, 2015 by gillianknitter.